REVIEW COMING SOON! 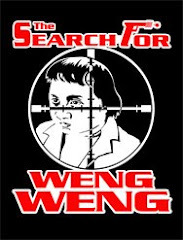 The second and more significant of Weng Weng’s collaborations with Dolphy (after 1980's The Quick Brown Fox) is Da Best In Da West from 1984, an elaborate 2 hour parody of Pinoy westerns again from RVQ Productions featuring Weng Weng in a cameo as Dolphy’s micro-deputy. Weng Weng’s director and instructor Eddie Nicart is stunt co-ordinator here for SOS Daredevils, and Peter Caballes is listed as an actor in the cast, as is For Your Height Only’s Yehlen Catral, Max Alvarado, Rodolfo “Boy” Garcia, and Weng Weng co-stars Romy Diaz and Tony Carreon (The Impossible Kid, D’Wild Wild Weng), Nina Sara (TIK), Steve Alcarado (DWWW) – the Weng connections are seemingly endless. Dolphy plays a reluctant hero who inadvertently shoot’s a town’s corrupt sheriff, is proclaimed the new Head Honcho, and ropes in the local midget Bronson (nice touch) to be his deputy. To be honest, Weng has little to do in Da Best... other than provide a bizarre novelty backdrop, wear garish black-and-white cowboy outfits and gesture excitedly during the fight scenes. At one point you hear his real voice - as expected, child-like and even higher pitched than his vocal double in For Y’ur Height Only (1981).